The Chariot is numbered the 7th and is part of the Major Arcana. The Chariot represents success, determination and achievement. Willpower is related to this card, showing that you can strive and apply yourself to succeed. Just don’t give up. If you keep going you will not fail. The Chariot represents determination and success when faced with a challenge that requires willpower. Don’t give up! Past – The Chariot in the Past position represents a past victory or success that is currently carrying you. You have to look to new horizons while maintaining the current balance. You may have started a new job or graduated from a new class recently. The aim is to look at your achievement, learn from them, and think where to go. 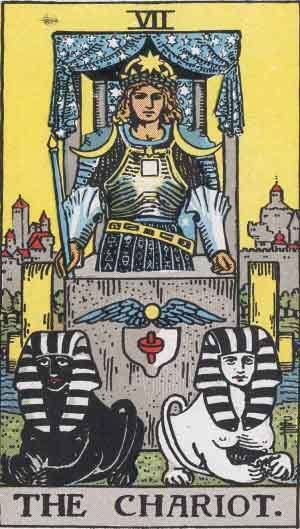 Present – The Chariot in the present position shows that you are about to, or are currently in the process of achieving something. You could be in the application process for a job you’ll eventually get, or learn a great deal from. The Prince has a Neutral look on his face. Though achieving, there is always a greater goal. Future – The Chariot in the future position gives you something to look forward to. Are you just laying the ground work for a new project? The Chariot is at it’s strongest when in the future position. Just be sure to be yourself. Working alone, in fact, might be good for you. Work / Education – The Chariot reminds you to focus on the bigger picture and end-goal. Don’t get distracted, but help other people out if you can. if you’re thinking of being self employed, go for it. Romance – The Chariot isn’t a good sign in romance. It can show competition between partners and senseless bickering. there might be one thing that both of you want and can’t share. It might also mean there is a situation where only willpower will help you through. Don’t be forced into anything. Friends – The Chariot again can show a bit of uneasiness with friendships. It might be a good time to be alone and focus on non-interpersonal things like a practical project. Obviously don’t neglect your friendships, but don’t get caught up and dragged along on things you don’t want to do. Money – The Chariot is good news in regards to finance. You might even have enough money to go a bit wild and splash out. as always, focus on your responsibilities and debts first. there is literally no reason to buy something like a flashy car or clothing when you could put that money to a much more useful purpose. Spirituality and Mentality – The Chariot suggests you should take an active part in developing your spiritual side. There are many paths but you won’t learn anything by dipping between them and being eclectic right now. Take the time to research into things a bit more deeper than usual. Many assume the character on The Chariot is a King. He is likely a prince, shown by his lack of beard, although this does little to play down his victories so far. He has achieved much, but always for somebody else. Standard symbology is also present, the two Sphinxes representing the mysteries and, as shown by their opposite gender; duality. As usual, the ancient egyptian connection is clear, not only with the present Sphinxes, but also the light hieroglyph pattern on the Prince. In reverse, The Chariot can represent a lack of willpower, control or direction when aiming for and achieving your goals. Whereas upright, The Chariot speaks only of achievement, when reversed, The Chariot reminds you to be mindful of your current drives and aims. Something may be wrong with the path you are following. Are you going in the right direction? Are you working on what you want to work on, or are you just helping somebody else achieve their dream? This isn’t specifically bad, but be careful not to sacrifice all of your energy for a goal you are not passionate about. We’ve selected live tarot readers to give you a FREE 3 Minute interpretation of The Chariot! Scroll through them below and pick your favorite one.